Traffic outside Albany: A bill to apply a road user charge to all vehicles of model year 2026 and later died in the legislature. Whatever happened to Oregon’s fledgling program of charging motorists a road user fee based on how far they drive? The 2017 legislature seems to have pretty much ignored the effort in favor of higher fuel taxes and registration fees. OReGO, as ODOT calls the program, started in July 2015 and called for volunteers to sign up 5,000 vehicles. They would receive mileage-reporting devices to install in their cars. Then the owners would be charged 1.5 cents per mile and get refunds for the gas tax they were also paying. ODOT billed the effort, authorized by the 2013 legislature, as a way to start getting more highway revenue in the face of increasingly efficient vehicles, especially hybrids and electrics. I signed up as an OReGO volunteer when the program started. In 2016 I got one gas tax refund check of $22.65. Since then my fuel consumption has been less and the difference between gas tax and mileage fee has been minuscule. So, no more refunds. This year, ODOT asked lawmakers to expand the program and make it mandatory for vehicles of the model year 2026 or later. The bill to that effect, HB 2464, died in a House committee. Instead, lawmakers approved a transportation bill that raises the gas tax 47 percent by 2026, from 30 cents a gallon now to 44 cents a gallon then. To get more road funds from highly efficient vehicles, the legislature also increased registration fees. The fees will go up on all vehicles, but the increases will be stiffer the more efficient a vehicle is rated. On electric cars the increase will be $100. And on some roads in the Portland area the legislature approved tolls. Lawmakers evidently no longer think the road user charge or mileage tax is the way to go. Oregon drivers don’t seem to think so either. Even though the program was authorized for 5,000 vehicles, only 1,307 were enrolled from June 2015 through December 2016, and only 669 were still active on Dec. 31, according to a state report issued earlier this year. As far as I can tell, OReGO continues to limp along, though so far it failed to record a 200-mile drive I took on July 16. And I haven’t heard anything about raising the 1.5-cent/mile charge to correspond to the coming boosts in the fuel tax, starting with 6 cents a gallon in 2018. In some states, it does go by value. Ie, registration for newer cars of more value is more than for older cars. I have to keep a car registered in California as I travel there for work, and I have seen this with my car down there. However, I disagree with this, as value of car is not relative to either road use or road degradation. An expensive car only driven on the weekends should not have to pay more than a beat up work day car drive to work each day. The gas tax is related to road use and degradation, so this is fairer. There is a valid argument on a tax by weight (or by types of tires, but that is hard to track) as heaver cars present more wear and tear on the road. A friend of mine recently purchased a Chevy Bolt. It’ is all electric, with a range of 240 miles or so. He really wanted electric, and looked at all that were in his price range (so the Tesla did not make the cut). He is over 6 feet tall and the Chevy Bolt is the one that fit his frame. I took it out for a ride with him, and was impressed. It is a 4 door sedan, with lots of power, and a range comparable to gas powered vehicles. He travels from Eugene to Portland frequently, and wanted something to make that trip, as well as just normal commute driving. I expect he will not mind paying a $100 extra registration fee in lieu of a gas tax. At 44 cents per gallon, it would take 227 gallons of gas. Comparing to a traditional car which drove 12,000 miles per year and achieved 30 mpg, that would be 400 gallons of gas per year. So if the registration is for two years, The gas powered vehicles are paying more taxes than my friend Bolt. It’s not an issue now, but I can see that if electric vehicles eventually become a significant fraction of cars on the road, we may have to adjust at that time in order to maintain our roads. However, I still think a simpler option is to simply have users declare their mileage at registration time, and use that to assess a road fee rather than the much more complicated and Orwellian box attachment. It would be a big chunk every two years (or every year if we allow for electric vehicles to move on to a 1 year registration cycle), but would be easy to implement. Instead, they decided to make I-5 and I-205 toll roads. 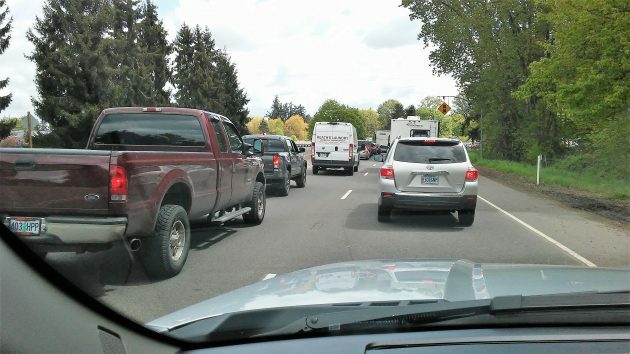 (How I-84 escaped escapes me – must be a commuting route for some key legislators.) At least this way the liberal Portlandians will carry most of the freight of their tax increase. NO they didn’t! It was “on the table” but not part of the final package. Bikes tho! I stand corrected, proudly & humbly. Given the current clown show of grifters, who knows what will happen at the federal level. OreGo suffered, or is suffering, the same fate as all ideas never communicated effectively. OreGo is just another acronym without a fan base because you gots to advertise. OreGo may as well have been NoGo given the marketing paucity. The future might bring fully autonomous, on-demand vehicles with the local, County or State farming out operations in competitive bids to greed-driven Elon Musk-types or others. Car ownership becomes pointless. Roadway funding is supported by the overall taxing authority as just another user-based utility fee. All hail Elon Musk! But wait, wait… the “first in the nation” BIKE tax will cure all ills. No? Why no mention HH? It is part of the package. Or am I living in an ALT-Universe? Flat TAX fans rejoice! $15 per pop.